I am not surprised at all that Justice Binta Nyako is not educated enough to understand that it is a judicial sacrilege for a presiding judge to overturn his or her previous ruling in the circumstance under reference even as she is a presiding judge in a federal high court of Nigeria. What a taboo! I am not also surprised that Justice Binta Nyako is not educated enough to know that a federal high court of a country like the dying Nigeria belong to nobody including the presiding judge, Chief Justice of Nigeria or even president of Nigeria. What an ignorance! I am rather surprise at what made Madam Binta Nyako, a Fulani woman who should be hawking cow milk in Daura market to abandon her hawking business and found herself as a presiding judge in a federal high court of Nigeria. What a mystery! It is only in place like the gasping Nigeria that such an unlearned Fulani woman judge will mount judicial podium to preside over a case. Heaven and earth will bear me witness that I called on Justice Binta Nyako severally through this medium not to commit career suicide in order to please the ungodly yearning of the ungodly tyrant of Nigeria called Gen Muhammadu Buhari. I even told her that the little judicial career and reputation she had built these few years should not be sacrificed for an ingrate like Mr Chinekwe mad dog of Daura. As Madam Binta Nyako who should be hawking cow milk in Daura market instead of being a judge has refused to heed the warning from wise counsels but chose to follow desperate fools like Rotimi Amechi to destroy her judicial career, today she has committed the greatest judicial blunder and sacrilege ever in her career as a judge. It is now on record for reference that Justice Binta Nyako of then federal high court Abuja on 12/1/2017, overturned her previous ruling that a laughable secret trial will be conducted on the ebulient leader of Indigenous People of Biafra (IPOB) worldwide, Mazi Nnamdi Kanu De Great. What a bad precedence or reference point! It is only if she hands-off the case that the bad reference will be deleted from history. It is completely unconstitutional for a trial judge to overturn a ruling of a court under reference in the manner which Madam Binta Nyako did. It is only a higher court that has powers to overturn the ruling of the federal high court and not the same court overruling itself. 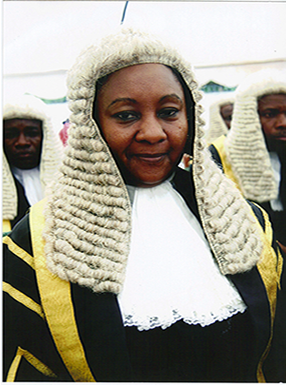 The only option according to judicial procedure in Nigeria left for Madam Binta Nyako of disgrace in the case under reference prior to the overturning of the ruling by suspending the secret trial is to locate the exit door and hands-off the case and return the case file to the Chief Judge, Justice Ibrahim Auta, so that Nnamdi Kanu De Great will be designated an outright PRISONER OF CONSCIENCE by international community. But because, Madam Binta Nyako is under a blackmail from Gen Buhari of disgrace, that should she fail to pervert justice and jail Nnamdi Kanu, her corrupt husband and son will be jailed for their corruption, so the foolish judge forgot her judicial oath of allegiance to the law of Nigeria. Justice Binta Nyako has completely shown the world that Nigeria is indeed a zoo as Nnamdi Kanu rightly said, where lawless is order of the day and a culture in the land. What a shame! I am still calling on Nigeria judicial council to punish Justice Binta Nyako for rubbishing the image of Nigeria judicial before the world with unguided utterances and rulings. Her unguided utterances is that she claimed that Nigeria federal high court is hers and she can do anything she like in it whether Nnamdi Kanu like it or not. Her unguided ruling is that she quickly ruled in favour of secret trial on the order of Nigeria illiterate president, Muhammadu Buhari without considering its consequences to the image of Nigeria judiciary even without consulting her 3-man bench in the court. Now that the primitive judge, Binta Nyako of shame has committed the judicial sacrilege in her bid to satisfy the ungodly yearning of the illiterate tyrant of Nigeria called Muhammadu Buhari, National Judicial Council should sack Madam Binta Nyako immediately in order to restore the battered image of Nigeria judiciary. If Nigeria Judicial Council also fail to heed my wise counsel and sack Madam Binta Nyako immediately because she is doing the bidding of Nigeria lawless president, a dangerous precedence has been created by Justice Binta Nyako which will mean that Nigeria judiciary is sitting on time-bomb that will explode in due time. Nobody knows on what occasion it will explode by having a judge or a defendant make reference to Justice Binta Nyako overturning of a ruling. I rest my case and cross my fingers to see what NJC will do. I wonder what the purpose of this article is. Is it to prejudice the outcome of the next months bail and dismissal hearing under this judge. I find it hard to see the benefit of the article to ipob's preferred outcome for the next court date and hearing. I love Biafra and can't stop talking about it!